- For men or women who suffer bladder leakage or urinary incontinence, this urinal can give you the freedom to get out for longer periods. - Urine rapidly drains from urinal into a collection bag. 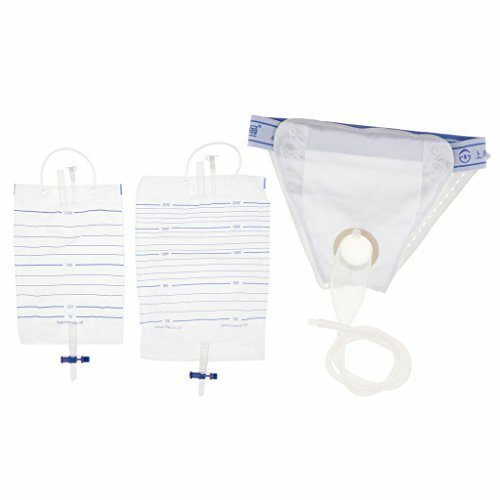 Two Bags ,1 1000ml daily use and 1 2000ml for night use.Portable, Re-useable, easy to clean. - The elastic waistband provides a comfortable, secure fit. Reduces falls, caregiver workload, odor, brief use and infections. - Wonderful aid for continent people with mobility disorders, urinary frequency, post operations, have difficulty ambulating to bathroom, Etc. Also great for traveling and camping. For men or women who suffer bladder leakage or urinary incontinence, this urinal can give you the freedom to get out for longer periods. Urine rapidly drains from urinal into a collection bag. Two Bags ,1 1000ml daily use and 1 2000ml for night use.Portable, Re-useable, easy to clean. The elastic waistband provides a comfortable, secure fit. Reduces falls, caregiver workload, odor, brief use and infections.